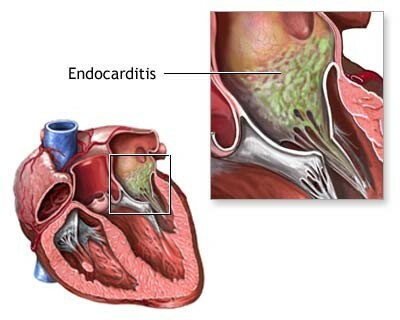 Endocarditis - an inflammation of the inside lining of the heart chambers and heart valves (endocardium), can involve the heart muscle, heart valves, or lining of the heart. Most people who develop endocarditis have underlying valvular heart disease. Injection drug use, recent dental surgery, permanent central venous access lines, prior valve surgery, and weakened valves are risk factors for developing endocarditis. Bacterial	infection is the most common source of endocarditis. However, it can also be caused by fungi. In some cases,	no causative organism can be identified. Hospitalization is often required initially to treat administer intravenous antibiotics. Long-term antibiotic therapy is required to eradicate the bacteria from the heart chambers and vegetations on the valves. strokes, surgery to replace the affected heart valve may be indicated.